European Council President Donald Tusk has quoted lyrics from John Lennon's Imagine to suggest the door remains open to the UK staying in the EU. Ahead of a Brussels summit he said of that prospect: "You may say I'm a dreamer, but I'm not the only one." Theresa May, who has said the UK will honour the referendum vote to leave, was due to outline her plans for the issue of expats' rights to EU leaders. Speaking at the summit she hailed the "constructive" start to Brexit talks. The gathering of 28 EU member states' leaders comes the day after measures to enable Brexit dominated the Queen's Speech. Mrs May's Conservatives are still trying to secure the Commons support needed to pass their programme. Mrs May told reporters as she arrived: "I'm going to be setting out some of the UK's plans particularly on how we propose to protect the rights of EU citizens and UK citizens as we leave. "That's been an important issue. We've wanted it to be one of the early issues to be considered in the negotiations. That is now the case. That work is starting." She also said she would be raising other important issues, including how European leaders could work together to stop the spread of extremism online and ensure there was no "safe space" online for terrorists. Brexit negotiations began on Monday. Speaking before the summit, Mr Tusk said: "It is a most difficult process, for which the EU is well prepared. You can hear different predictions coming from different people about the possible outcome of these negotiations - hard Brexit, soft Brexit or no deal. "Some of my British friends have even asked me whether Brexit could be reversed and whether I could imagine an outcome where the UK stays part of the EU. "I told them that, in fact, the European Union was built on dreams that seemed impossible to achieve. So, who knows. You may say I'm a dreamer, but I'm not the only one." 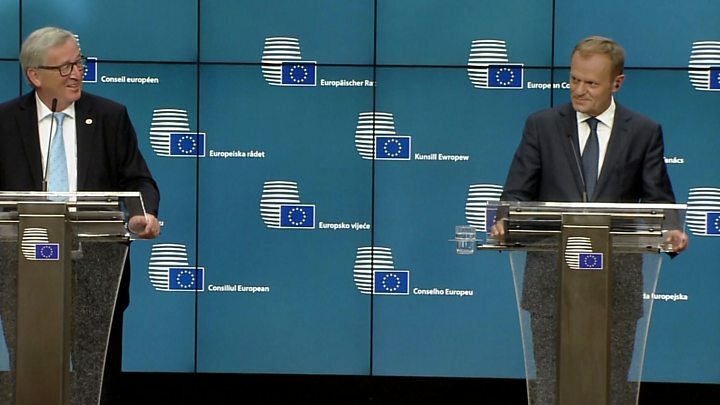 His comments were raised at a press conference in Brussels later with President of the European Commission, Jean Claude Juncker, who said: "In Europe, I never have illusions because I don't want to lose them." But Mr Tusk said: "I still have dreams. Politics without dreams - it would be a nightmare." "If you had my experience from my part of Europe you would know that miracles do happen and some of my political dreams have come true... but at the same time I am a realist, this is why first of all we should start our negotiations as effectively as possible and the final decision... this is a decision for Britain and UK citizens." 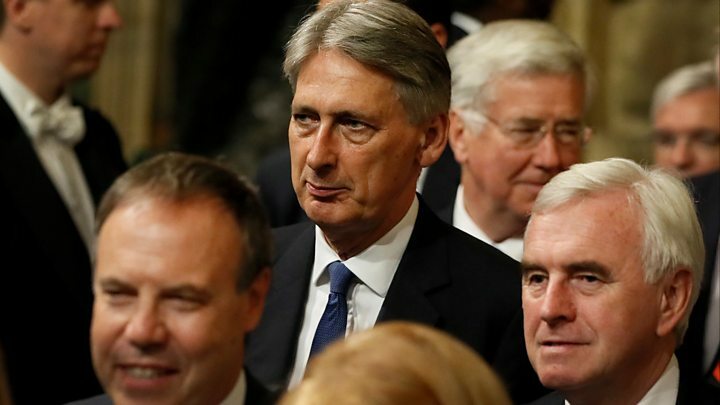 Earlier Chancellor Philip Hammond told BBC Radio 4's Today he wanted an early agreement on the principle of a "transitional" period to reassure business there would not be a "cliff edge" when the UK leaves the EU at the end of March 2019. He also denied that a series of controversial Conservative manifesto commitments had been dumped in the wake of the disappointing election result. 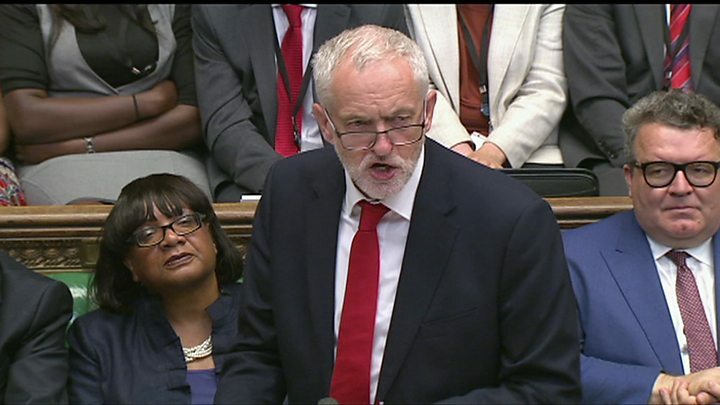 He told Today that the manifesto was for a five-year period, but the Queen's Speech programme had been for the first two years, which are dominated by the process of Brexit. Both the UK and the rest of the EU say they want to come to an arrangement to secure the status of about 3.2 million EU nationals living in the UK, and 900,000 Britons overseas, but nothing has been decided so far. UK opposition parties have urged the government to make a unilateral guarantee to the EU migrants - but ministers have insisted a reciprocal deal is needed to ensure British expats are protected. Mrs May will not be present when the leaders of the remaining 27 EU states hold a brief discussion about Brexit after her presentation. They are expected to consider the relocation of the two EU agencies governing medicine and banking which are currently based in London. Of the 27 bills in the Queen's Speech, eight related to Brexit and its impact on immigration, trade and sectors such as fisheries and farming. At the centre was the so-called Repeal Bill, which will copy over all EU laws into UK law, with Parliament then deciding which bits to retain. With MPs voting on the speech next week, the Conservatives are hoping an arrangement with Northern Ireland's Democratic Unionist Party will be in place to support their minority government. But despite both sides saying they were confident of a deal being agreed, sources suggested to the BBC the DUP were "getting to the limits" of what they were requesting in return for supporting the Tories - with the chances of a plausible long-term deal, rather than a short-term bargain to get the Queen's Speech through, diminishing. As well as clearing the Commons, Brexit legislation will also have to navigate the House of Lords, where the Tories also do not have a majority. Another potential obstacle could emerge if the approval of the Scottish Parliament is needed for the Repeal Bill. Speaking in the Commons after the Queen's Speech, Mrs May said there was a "possibility" the bill, which is needed to stop EU law applying in the UK, could require Holyrood's consent. At the two-day summit, where the agenda is formally dominated by immigration, security and the economy, Mrs May will also brief her counterparts on the UK's commitment to a new £75m plan designed to stem the flow of illegal migrants from Africa to Europe.